There are several ways by which plants produce their offspring. These are categorised into two types: (i) asexual, and (ii) sexual reproduction. In asexual reproduction plants can give rise to new plants without seeds, whereas in sexual reproduction, new plants are obtained from seeds. In asexual reproduction new plants are obtained without production of seeds or spores. It is a type of asexual reproduction in which new plants are produced from roots, stems, leaves and buds. Since reproduction is through the vegetative parts of the plant, it is known as vegetative propagation. 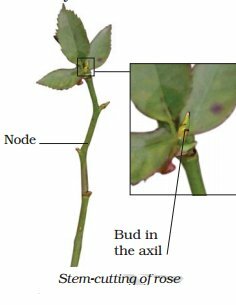 Cut a branch of rose or champa with a node. This piece of branch is termed a cutting. Bury the cutting in the soil. A node is a part of the stem/branch at which a leaf arises .Water the cutting every day and observe its growth. Observe and record the number of days taken for roots to come out and new leaves to arise. Try the same activity by growing money plant in a jar of water and record your observations. You must have seen flower buds developing into flowers. Apart from flower buds, there are buds in the axil (point of attachment of the leaf at the node) of leaves which develop into shoots. These buds are called vegetative buds . A bud consists of a short stem around which immature overlapping leaves are folded. The vegetative buds can also give rise to new plants. Take a fresh potato. Observe the scars on it with the help of a magnifying glass. You may find bud(s) in them. These scars are also called "eyes". Cut a few pieces of a potato, each with an eye and bury them in the soil. Water the pieces regularly for a few days and observe their progress. What do you find?Likewise you can also grow ginger or turmeric. Bryophyllum (sprout leaf plant) has buds in the margins of leaves . 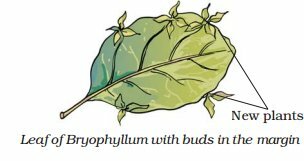 If a leaf of this plant falls on a moist soil, each bud can give rise to a new plant.The roots of some plants can also give rise to new plants. Sweet potato and dahlia are examples. Plants such as cacti produce new plants when their parts get detached from the main plant body. Each detached part can grow into a new plant.Plants produced by vegetative propagation take less time to grow and bear flowers and fruits earlier than those produced from seeds. The new plants are exact copies of the parent plant, as they are produced from a single parent. Later in this chapter you will learn that plants produced by sexual reproduction have characters of both the parents. Plants produce seeds as a result of sexual reproduction. You have already learnt about the tiny organisms like yeast can be seen only under a microscope. These grow and multi ply every few hours if suffi cient nutrients are made available to them. Remember that yeast is a single-celled organism. Let us see how they reproduce? Take a piece of yeast cake or yeast powder from a bakery or a chemist shop. Take a pinch of yeast and place it in a container with some water. Add a spoonful of sugar and shake to dissolve it. Keep it in the warm part of a room. After an hour, put a drop of this liquid on a glass slide and observe under a microscope. What do you observe? You may see the formation of new yeast cells. The small bulb-like projection coming out from the yeast cell is called a bud. The bud gradually grows and gets detached from the parent cell and forms a new yeast cell. The new yeast cell grows, matures and produces more yeast cells. If this process continues, a large number of yeast cells are produced in a short time. Yo u might have seen slimy green patches in ponds, or in other stagnant water bodies. These are the algae. When water and nutrients are available algae grow a n d mu l t i pl y rapidly by fragmentation. 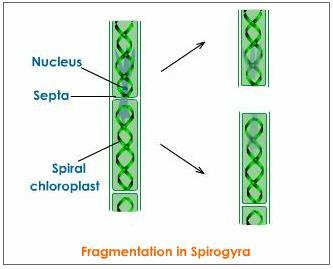 An alga breaks up into two or more fragments. These fragments or pieces grow into new individuals . This process continues and they cover a large area in a short period of time. In Chapter 1 you learnt that the fungi on a bread piece grow from spores which are present in the air. Repeat Activity1.2. Observe the spores in the cotton-like mesh on the bread. When spores are released they keep floating in the air. As they are very light they can cover long distances. The spores are asexual reproductive bodies. Each spore is covered by a hard protective coat to withstand unfavourable conditions such as high temperature and low humidity. So they can survive for a long time. Under favourable conditions, a spore germinates and develops into a new individual. Plants such as moss and ferns also reproduce. All organisms multiply or reproduce their own kind. In plants there are two modes of reproduction, asexual and sexual. There are several methods of asexual reproduction such as fragmentation, budding, spore formation and vegetative propagation. In vegetative propagation new plants are produced from different vegetative parts such as leaves, stems and roots. Flower is the reproductive part of a plant.